Barcelona and Reus airports are the nearest ones to Hotel Villamarina Club. The majority of tourists reach the Costa Dorada using Reus airport. 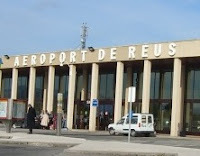 At the moment Ryanair, First choice airways, Mytravel airways, Thomsonfly and Thomas Cook airlines have got plenty of UK and Ireland departure cities that fly to Reus airport. - Taxi: the journey takes between 15 and 20 minutes subjected to traffic. It costs between 24 € and 30€. Taxis in Spain take 4 passengers plus the driver. There are a few taxis who can take up to 6 people and also for disabled people but they need to be booked in advance or use the taxi rankin front the arrivals gate in the airport. Please have a look at Salou and Reus taxi companies Taxi Servei Logics SL (+34 902 385 050), Radio Taxi Salou (+34 977 385 090), Taxis Costa Daurada (+34 977 382 107) and Taxis Reus (+34 977 345 050). - Bus: The journey takes around 25 minutes also depending on the traffic and the ticket costs 5.60 € per person for one way or 9.55€ for a roundtrip ticket (please make sure you ring them before your departure date to reconfirm your pick up time). Children under 4 years old go for free. The bus stop is just in front of the arrivals gate at Reus airport and you get dropped off at the Hotel Villamarina Club. For more information please visit Autocars Plana. - Car Rental: Another option is to rent a car to visit the area and its surroundings. At Reus airport you can find different companies such as Avis (+34 977 779 855), Europcar (+34 977 779 851), Hertz (+34 977 779 872) and Sol-Mar (+34 977 778 480). The prices may vary according to the time of the season. Make sure you book your car in advance. - Taxi: The journey takes about one hour and 15 minutes, depending on the traffic. The approximate cost of the journey is 150€. There is a taxi rank in front of the 3 arrival gates of the airport. - Bus: There is a bus from Barcelona airport to Salou with stops at Port Aventura and La Pineda. The journey takes one hour and a half. The bus stop is in front of Terminal B arrival gate. This bus is operated for Autocars Plana. Alsa company also do transfers from Barcelona airport by bus to Tarragona. When arriving at Tarragona you need to get a taxi to Hotel Villamarina Club which costs around 20.00€. The bus stop is also in front of Terminal B arrival gate. - Train: There is a train station at Barcelona airport. Line 10 connects the airport with Barcelona city. There are trains every 20 minutes depending on the day and the time and the ticket costs 2.50€. Once in Barcelona it is necessary you need to stop at Barcelona Sants station and get another train to Salou. The train ticket from Barcelona to Salou costs between 6,00 and 18,00 € according to the type and category of the train and lasts about 90 minutes. Salou’s train station is 450 metres from the Hotel Villamarina Club. - Car rental: The companies that offer this service are the following: Avis (+34 932 983 600), Europcar (+34 932 983 300), Hertz (+ 34 932 983 637), Sol-Mar (+34 932 983 433). All of these companies do have offices in Terminal B and C. Bare in mind that while in the highway you will have to pay toll. There are also a few companies which arrange transfers from both airports to the Hotel Villamarina Club. You may wish to have a look on the Internet. We hope this information is useful for you and makes your next visit to the Hotel Villamarina Club easier, cheaper and more enjoyable. If you have been in Salou and wish to share your experience regarding transfers please do not hesitate to write your comment.